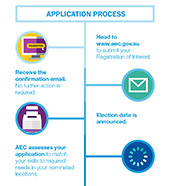 Registering your interest for election work is easy through the online AEC Employment system. It should take you around 10 minutes to complete a registration of interest (ROI) to work at federal elections. availability for work and preference for roles and locations. read the statement about political neutrality. It is important that the information you include is accurate and current. Regularly save the data you enter to avoid losing it as the system automatically times out after 20 minutes. You can log back in to reset the time limit and continue your application. If you have previously registered for election work, you don’t need to create a new ROI. Review and update your old ROI to ensure the information is current and correct. If you no longer wish to be registered for election work, you can remove your details form the register by cancelling your ROI. Character check tab – some roles require a character check. If you are selected for one of these roles and do not give your consent, you won’t be offered a role. You have to provide the full details of any convictions of finding of guilt, including traffic convictions. Experience and skills tab – this section includes eight free text boxes to expand on your skills e.g. customer service, office administration skills etc. You are limited in the amount of text you can include in this section (up to 1,000 characters). Provide clear and concise examples, using plain language and short sentences. In my current role as a customer service officer in the call centre I deal with a diverse range of customers every day. I am always respectful, polite and professional. In difficult situations I stay calm and listen carefully to the customer while trying to resolve the issue. I make sure every customer I deal with has a positive experience. Location (work) preferences tab – you can nominate up to ten locations in the order of preference. If you are prepared to travel outside of your preferred areas, please specify the distance or how far you would be prepared to travel. Role preference tab – your ROI should refer to the positions listed on the election positions page. You can choose one or multiple positions. Other information tab – allows you to add further information about your background, abilities, any medical conditions that may assist the AEC with allocating a suitable role for you and any workplace modifications required. Check your ROI for spelling and grammar before you submit it. Ensure you complete all the required tabs as any missing information will result in delays and may affect the outcome of your application. Details of your Tax File Number, bank and superannuation are not requested at sign up. These are required after you receive an Offer of employment. The AEC runs an ongoing election recruitment process so there is no fixed date by which you'll know if your application is successful. The AEC sends employment offers to applicants via email progressively after the announcement of an election. For example, for the 2016 federal election on 2 July 2016, the AEC commenced sending out Employment Offers for early voting positions in mid-May, and the majority of offers for work on election day were sent out by mid-June. Submitting an ROI does not guarantee employment. The AEC receives a high level of interest in temporary election work across most areas of Australia. To improve your chances of receiving an offer of employment, you may like to consider nominating more than one preferred work location during the ROI process. You can nominate up to ten locations in your ROI. The application and employment process infographic shows the steps involved from submitting your Registration of Interest (ROI) to employment. You can submit an ROI online through AEC Employment at any time. No further action is required from you. The AEC will assess your application. The AEC may contact you via phone or email. If a suitable role is available, the AEC will contact you and provide details of the role, times and location. The AEC will send you an offer of employment via email. If you are interested and are available, the AEC will issue a Letter of Offer to you. You can accept the offer of employment via email. If you receive an offer of employment and accept it, you will get a confirmation of employment letter. The letter includes the details of the role and any training required for the role. I’ve been working at elections for many years now and every election I love to pass on what I can to younger people, who are doing this work for the first time. It’s crucial that all Australians are able to cast their vote and it always gives me a great feeling to help people engage with the process. Ned David, Director of Education Services and a Kulkalaig Traditional Owner from the Central Islands in the Torres Strait, QLD.